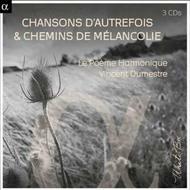 Vincent Dumestre and his Poème Harmonique invite us to the sources of the songs, laments and romances of the France of the past. Reproducing the pronunciation of the time and combining various early, and sometimes rustic, instruments with the voices, the programme will appeal to everyone, young and old alike. Here we hear songs passed down from generation to generation, some well-known, some forgotten, but always sensitive to the heart of a broad public today.